Taking a dip in the pool after an intense workout sounds like a great way to cool down, especially during the summer with the temperatures rising. There are many excellent reasons to go swimming other than to cool down. You don’t need to be a professional swimmer to include this exercise in your sports training routine. In fact, you should do it because you’re not a professional swimmer. Swimming can help all athletes. Here’s what you can gain by including some swimming sessions in your training. Recovery is crucial in any sports training program. Active recovery is especially good for your athlete’s body. What better way to actively recover than by swimming in the pool? Land-based athletes don’t need to be professional swimmers to supplement their training with aquatic exercise. Swimming is a low-impact exercise. Plus, there’s the buoyancy in water factor to consider, meaning your joints and muscles will be more protected than on land. If you’re battling with chronic injuries, swimming might give you the necessary respite you need. As for healthy athletes, swimming can help prevent injuries. Swimming just might be the best active recovery method out there. Sports such as soccer require lots of stamina and endurance. Athletes can gain that with the right swimming technique. Swimming allows you to train for longer periods, which helps you burn more calories (if that is what you’re looking for) and build stamina. If you're looking for other ways to build stamina, you should contact the sports training experts at Atheltic Republic of Orange County. Call them at (714) 972-2762 to talk about creating a program to meet your athletic needs. When you swim, you use all body muscle groups simultaneously, which helps you strengthen your core much faster than many weight training programs. The kicking motion helps engage your abdominal core muscles. There are also some pool workouts that involve flotation devices where you can try to isolate your kicks and build an even stronger core. Plus, you won’t even notice how much you’re working out since everything is seemingly less painful and tiring under water. Swimmers need to be able to hold their breath for extended periods of time. More than that, swimmers are more capable of controlling their breathing than on-land athletes. Swimming requires that you perform a high-intensity exercise with a limited supply of air, which increases your lung capacity. Stronger lung capacity will help you with any on-land activity. As you learn to control your breath, you will learn to regulate your heart rate much quicker. You need to stretch after every workout to prevent injuries, recover, and improve your flexibility. Swimming can also help you relax, enhance your flexibility, and stretch your muscles. High-intensity exercises such as running, cycling, and soccer promote the lactic acid build-up in muscles. FYI, that’s the reason why you’re so sore after a workout. A relaxing swim can help you release those toxins that keep your muscle tense and reduce your soreness. You don’t want people to know how often you skip leg day, right? Instead, you should be aiming to build a more balanced body, and swimming can help you do that. If you’re a weight trainer, you target short muscle groups when you lift, whereas when you swim you build longer and leaner muscles, so you’re providing your body with an excellent balance. In the preseason of most sports, athletes search to improve their cardiovascular endurance through different types of fitness training. This is the perfect time to add some swimming sessions to your sports training. 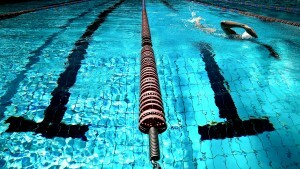 Swimming requires lots of cardiovascular endurance. You can get it as well from running or cycling, but you would also get more joint stress and a greater focus on your lower body. If you want a balanced cardio workout, swimming is the answer. Plus, since you’re probably not used to swimming, it will challenge your body like no other cardio exercise. Looking for a Better Sports Training Program This Summer in Santa Ana? Head over to Athletic Republic of Orange County and talk to their trainers about developing a sports training program exclusively for your athletic needs. If you’re a swimmer and want to improve your training or if you just want to add some swimming sessions to your routine, this is the place to do it. Call them at (714) 972-2762 to schedule a free training session.